A queue can be rather useful when you want to process a lot of data, but also when I just want to make sure things react quickly. Let’s have a look at a simple case where you might want to send an email. In a lot of cases people send e-mails right in a controller action. This is okay for a lot of sites, but sometimes if things are mission critical it helps to use a queue. Imagine what happens if there’s a temporary problem with the mail system, since you’re sending it right in your controller you’ll probably show the user an error message telling him that something went wrong. Seeing errors is hardly ever a good thing, with a queue you could use a simple operation to put the action in a queue and process it later. If it fails you could try again a bit later and if it fails permanently put it in a log file you’re monitoring. There might also be a maintenance task that you can finish before PHP times out. Using a queue would make it more solid, put every object you want to process in a queue and process it piece by piece. With this we are putting the number 1 in a queue called “queue-demo”. Now that we have objects in our queue we need to process them. When processing a queue we obviously have to use the same queue name. That’s basically all you need to do, but you’ll of course need to put that code somewhere. Locking and unlocking process. Helps to ensure the command is only running once. You’ll just have to run your command regularly to execute it, a cronjob like this should do the trick: “./concrete/bin/concrete5 queue-demo:process-notifications”. There’s also a way to handle everything in a job which is especially useful for maintenance tasks as it doesn’t require that you add queue items initiaited by a user action. There’s a good article in the official documentation about this: https://documentation.concrete5.org/developers/jobs/creating-and-scheduling-a-queueable-job. Some of the code was written by Michele Locati. Hope you enjoy working with queues! After I published my article about VueStrap things have changed a bit. 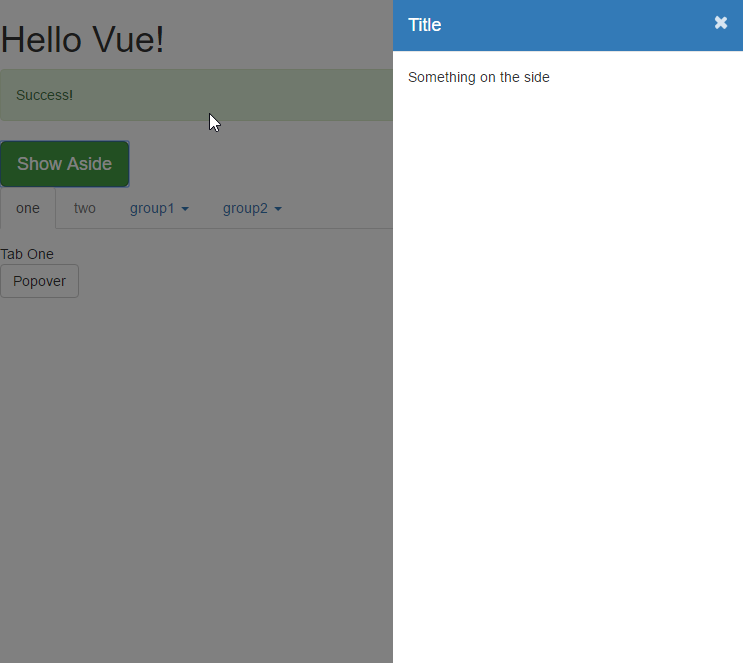 We now have the awesome version 2 of VueJS and obviously we need to build a UI with it at some point. I took that as a reason to have another look at the UI libraries. http://vuikit.github.io/vuikit/ Feel clean and simple. Button checkboxes where only the button border changes feels a bit too subtle to me, but overall it looks pretty good. http://quasar-framework.org/ Seems to have a focus on mobile devices, but works on a desktop too. Extensive documentation, great first impression. http://element.eleme.io/ Unfortunately this is only in Chinese, but some parts are in two languages, that’s good enough to find the component you need. Looks pretty solid too, but seems to have less components than Quasar. 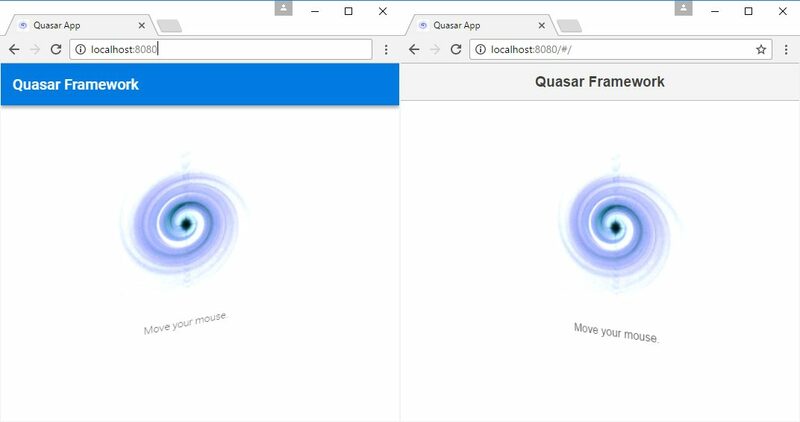 I’ve decided to give Quasar a go as it feels very complete and solid. 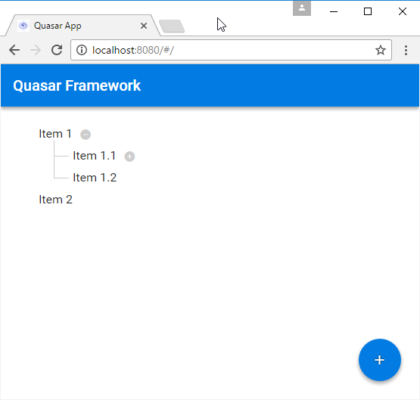 Getting started with Quasar Framework. Awesome, material and iOS style in a second! How awesome is this, it helps me to write nicely formatted code and even tells me right in the browser with live reload. Let’s remove the trailing spaces and give it another try. Spaces removed and it works, no issues at all! 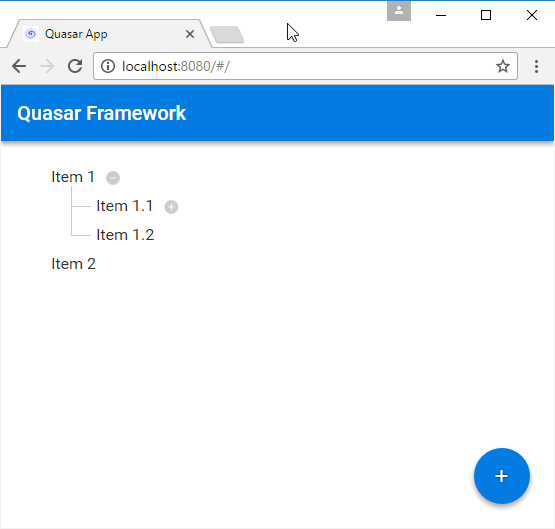 I’m impressed with Quasar Framework! The first impression lasts! I played around with a few more things and whatever I do work well. There’s even a live reload plugin for Android. All those features at this quality is amazing. 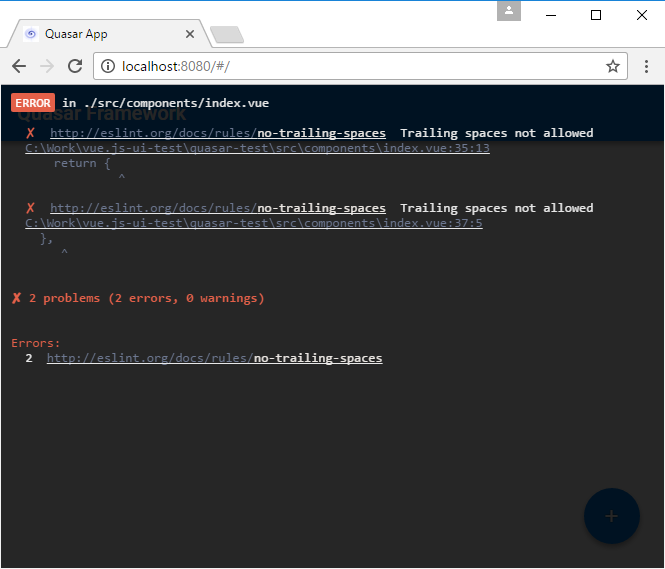 I recently became quite fond of Vue.JS. It feels like a simpler version of AngularJS 1 / Angular 2 and so far came with everything I was looking for. It took me a while to get everything up and running, npm with all its dependencies, multiple versions and more alpha than beta libraries it can be a bit annoying, but once things are running smooth, it’s quite job. Naturally I need to have some kind of graphical interface. As I’m pretty experiences with bootstrap, I just felt that I should go with something not completely new to me. With currently 2364 stars and a lot of activity just a few hours ago the project seems to be very much alive. I was also happy to see 45 different contributors, the majority of the work done by fewer people though. Here’s the project’s home: https://github.com/yuche/vue-strap. Please note that I’ve specify version 1 as version 2 isn’t stable yet. Once the project has been created we have to install the npm modules. Please note that I’m also installed bootstrap as we require its CSS and style-loader so that we can easily embed bootstrap from our component. More about that later. While it seems to be pretty cool, I’m not convinced it’s stable enough to be used in a large scale project unless you’re okay with fixing a few things yourself. It’s free after all and the code isn’t too difficult to understand once you’ve got a hang of Vue.JS. I’ll keep on testing other frameworks to narrow things a bit down. In 5.7 a few things have changed. 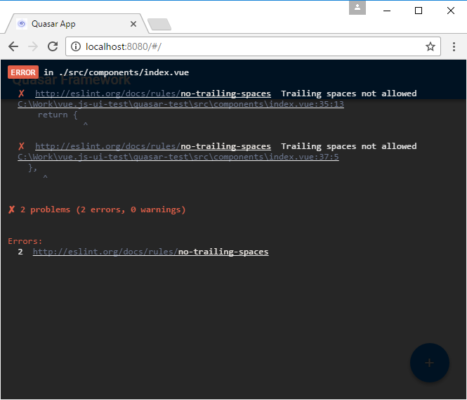 The idea is still the same, but you’ll have to use namespaces and loading classes is a bit different too. 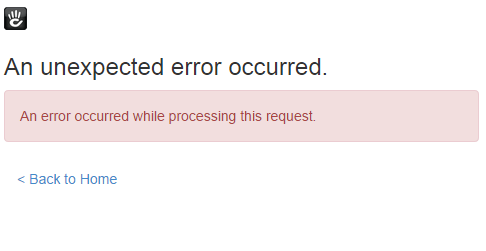 Please note that we’re checking if the request is handled by an AJAX request. This can help to avoid collisions if you inject more things. Please note that “OrticToolbar” refers to my package. concrete5 version 5.7 is out for a couple of month and as always with a major version, old stuff might is broken and it takes a while to find new packages, resources and information. I tried to assemble a list of open source packages for 5.7 which you can use in your project or learn from to build your own packages. Please note that some packages aren’t stable yet, it’s not a list for end-users but rather a list for concrete5 developers eager to learn about building add-ons. Please let me know if I have missed a package, I’ll happily update my list. As you might have heard, a major release of concrete5 has been published. If you haven’t, here’s a list of things that have changed http://www.concrete5.org/documentation/background/version_history/5-7-0/. In this post, I’m going to look at the process of upgrading an existing package which worked for version 5.6. I’m doing this step by step to show to show you possible error messages which might help you convert you own packages, but please note that I’m aiming at concrete5 developers knowing version 5.6 and will thus skip a few things which haven’t changed. I’m going to use a simple package I wrote a while ago, it’s the zoom image block which allows you to zoom into a single image. Much like lightbox, but limited to a single picture. The code can be found here https://github.com/Remo/concrete5-zoom-image. bootstrap – as the name tells you, here’s where things get started, loaded etc. Before you install anything, make sure you’ve got a database dump you can easily restore, it might make things easier. A package controller class is always called Controller. The namespace of your package controller has to start with Concrete\Package\ and must then be append with the camelcased name of your package. Class 'Concrete\Package\ZoomImage\BlockType' not found. As I’ve mentioned above, the src directory contains some rather useful classes. 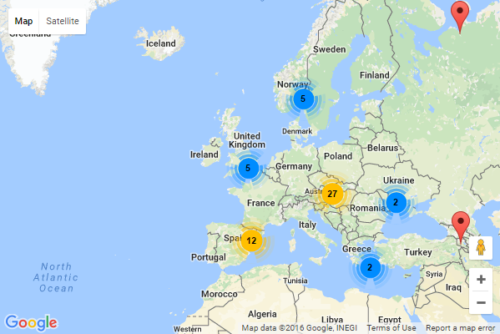 We’re looking for something related to blocks and no surprise, there’s a Block directory. If you look at src/Block/BlockType/BlockType.php you can see where the missing class is. Open the file and you’ll know the namespace we have to import. Unfortunately the package got installed anyway and uninstalling can be tricky if parts of your code haven’t been upgraded for 5.7. Let’s just restore that dump file we’ve created and try to install the package again. Guess what, the next exception. The zoom image block uses an old out-dated method called Loader::block. Remove it, restore the dump file and try again. Next, you’ll get an exception because BlockController isn’t defined. Namespaces again! While we do this, we can also make the class name change like we did with the package controller. The class is simply called Controller too. You’ll have to derive it from \Concrete\Core\Block\BlockController. If you look at the code below, you can see that I didn’t specify the fully qualifier name when deriving the class but rather added another statement to use. Drag your block into the page and release it. The block interface shows up, but after adding the block, nothing happens. That’s because the AJAX magic hid the error message, reload the page and you’ll get your next exception to work with Class 'Concrete\Package\ZoomImage\Block\ZoomImage\File' not found. As you can see, it tries to load the class File in our own namespace where it can’t be found. We forgot to add another use statement. Let’s add \Concrete\Core\File\File and reload the page. We now get the message Call to a member function getFileObject() on a non-object. Accessing the controller from view.php was a bit of a habit when you looked at code back from version 5.0 and a bit later. Before we worry about the message, let’s make sure we properly forward data from the controller to the view and not the other way round. You can find the commit I’ve made on github, a proper diff file might help https://github.com/Remo/concrete5-zoom-image/commit/fa0895081b62fbbb53d8e79c00858619fcec1fd4. The fact that computers aren’t perfect at calculation is something most developers know. 1/3 can’t be saved as a floating point number, it would be infinitely long, 0.3333… If you aren’t aware of that, check out this site, it explains the problem quite nicely http://floating-point-gui.de/. Most people who work with SQL rarely come across this problem, but there’s one pitfall which in my opinion is even more dangerous, especially since SQL handles this problem in most cases quite well. Now that we have some data to work with, let’s query our table and add two columns with a static value. What does this tell us? It’s simple, when you query data from a table, it will use the precision of the column type. But when you do some arithmetic in an SQL query, it will use floats by default and thus be imprecise. If we cast it to a decimal, we can get a precision of 64 digits. Not a big deal, but make sure you’re aware how you do your calculations in SQL! 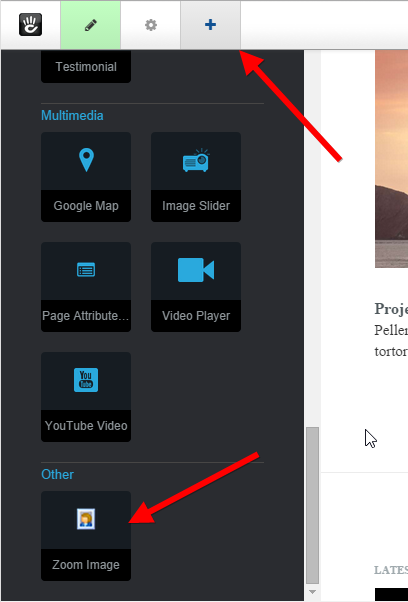 When you build an add-on with concrete5, you’ll sometimes want to hide a few things depending on the users or group. You might be tempted to hard-code a check to a specific group, but there’s a much more elegant way to handle this. It also gives you a lot more power to control who’s allowed to do something, just in case your customer changes. That’s all we need to add a custom attribute key. If you install the package and navigate to “/dashboard/system/permissions/tasks/” in your dashboard, you’ll see your custom permission keys at the end of the screen. As you can see, our new permission key doesn’t have any groups assigned to it. You can either do that manually, or by code. In the example above, the first permission key shows you how to do that. Just have a look at the lines 33 to 40. We get an instance of our administrators group and then pass it along a permission access object which we can assign to our permission key. You can find the complete example on github, https://github.com/Remo/codeblog/tree/master/codeblog_task_permissions. 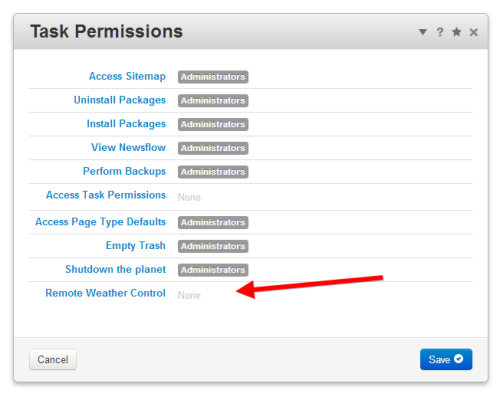 If you use the example and want to check the permissions, point your browser to http://1/index.php/tools/packages/task_permissions/check_permissions and you’ll see weather you have the permission to the keys or not. In most cases you’ll find situations where the developer mixed a code like shown above with an external CSS file. If these instructions were a bit short, you can find a working example in one of my github repositories, check this: https://github.com/Remo/concrete5-cover-picture/blob/master/blocks/cover_picture/controller.php#L43-L81. I hope this helps you to clean up your code!